What can you say about Bob Dylan? The man is his own genre. No other songwriter from modern times can claim as much cultural and musical significance. Nor has there been a troubadour as willing to take as many musical turns, challenging (and occasionally alienating) listeners with a body of work that constantly changes step, stumbling into and exploring unfamiliar territory. Born in Duluth, Minnesota in 1941, Bob Dylan has released over sixty albums and compilations. During his rise to prominence in the early 1960s, he became more than a household name with folk-inspired songs like Blowin’ In The Wind and The Times They Are A Changin’. His early popularity and appeal almost ran contrary to the popular music of the time. While rock bands like the Beatles and Rolling Stones, and pop groups like the Beach Boys and the music coming out of Motown all were coming into their own, Dylan crafted folk tales that consisted of simple acoustic guitar arrangements and harmonica. The sudden popularity of his topical and socially-conscious music forever associated him with the civil rights movement and counter-culture of the era. By his early twenties, Dylan’s brand of folk-rock achieved commercial and artistic success that surpassed even that of his own musical idols Hank Williams and Woody Guthrie. It’s hard to believe how fiercely he was criticized when he introduced electric instruments into his music in 1965. Highway 61 Revisited, released that very year, opens with the legendary six- minute song Like a Rolling Stone, which if anything signals the end of Dylan’s career as a protest singer and rebirth as rock n’ roll singer with something to say. In 2004, Rolling Stone magazine chose this song as the greatest song of all time, saying that “No other pop song has so thoroughly challenged and transformed the commercial laws and conventions of its time.” Touring at this time, Dylan divided his concerts into two sets: a solo acoustic performance, followed by a raucous electric set which featured Ronnie Hawkins’ band the Hawks, who would soon rename themselves as The Band. At times the electric set would be jeered by fans that still preferred to hear the acoustic folk music. Over the course of the 1970s Dylan released more than ten albums, including Before The Flood, a double live album documenting his tour with The Band. He had recorded extensively with The Band in the late sixties writing several albums worth of music, some of which would eventually appear on The Basement Tapes. Dylan also worked with George Harrison, first appearing on Harrison’s debut solo album with If Not For You and later taking part in the Concert for Bangladesh in 1971. Showing an interest in other arts, Dylan appeared in the 1973 film Pat Garrett and Billy the Kid. While the film is recognized as a one of director Sam Peckinpah’s major works, it’s often remembered for the music Dylan supplied the soundtrack, especially the sublime Knockin’ On Heaven’s Door. This soundtrack album is often overlooked in light of the huge successes that followed. In 1975 Dylan released something of a comeback album, with the deeply personal Blood on the Tracks. The album was a critical and commercial success with the songs Tangled Up In Blue, Simple Twist of Fate and Shelter From the Storm (all available as song lessons on Guitar Noise). Sometime in the late 1970s Dylan announced he was a born again Christian and subsequently released a trilogy of spiritually themed albums. Among them was 1979’s Slow Train Coming which features guitar work by Dire Straits front man Mark Knopfler. The song Gotta Serve Somebody was a hit and won a Grammy award. Dylan again enlisted Mark Knopfler in 1983 to produce the album Infidels. This album is generally seen as Dylan’s return to secular music, although songs like Jokerman still contain biblical and religious references. If anything, the song melds Dylan’s socially conscious folk roots with a spiritual rebel message. Constant touring throughout the 1980s may have helped Dylan lighten up. He played with Keith Richards and Ronnie Wood at the end of the Live Aid concert in 1985; toured with the Grateful Dead in 1987, releasing a live album, Dylan and the Dead, commemorating the occasion; and reunited with George Harrison to become a member of The Traveling Wilburys in 1988. 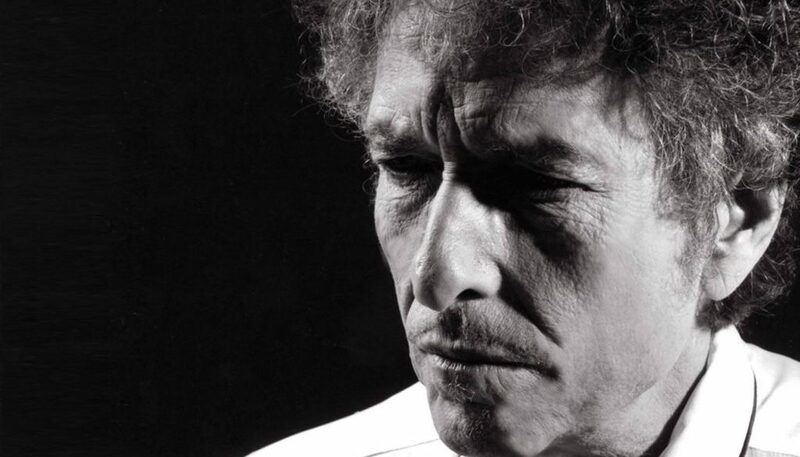 Throughout the 1990s and 2000s Dylan continued to release strong albums that ventured into different musical territories, such as folk, blues, rockabilly and swing – almost anything distinctly American. In 2005, a Martin Scorsese documentary, No Direction Home, dissected Dylan’s life and music from 1961 to 1966. 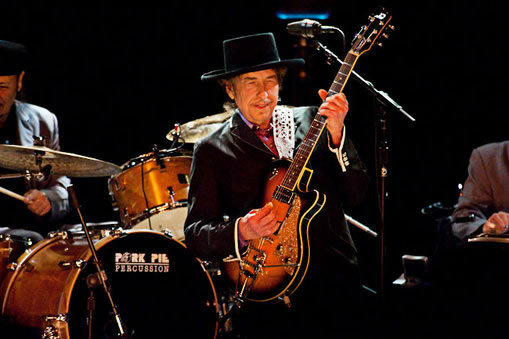 Dylan released the eighth installment of his bootleg series entitled Tell-Tale Signs in 2008. The twenty-plus songs consist of outtakes and rare songs recorded between 1989 and 2006. In early 2011 Dylan played his first concerts in communist China and Vietnam (See our review of Bob Dylan Live in Ho Chi Minh City). His most recent album, Triplicate, was recorded with his touring band and consists of 30 new recordings of classic American songs. Mr. Dylan celebrated his 76th birthday on May 24, 2017 and is currently still on tour. What can you write about someone who, essentially, is a whole genre of music? About someone who posted in his high school yearbook that his ambition was “to join Little Richard?” About someone who’s latest recordings are as influential as the first ones he made close to fifty years ago? Dropping out of college, Dylan moved to New York to join the folk scene of the big city. He made a point of visiting his idol, Woody Guthrie (who was hospitalized with Huntington’s Disease) and also made friends of Guthrie’s pal Ramblin’ Jack Eliot, who taught Dylan much of Guthrie’s music. Performing at many Greenwich Village clubs, he was noticed and signed to Columbia Records, who released his self-titled debut album in 1962. While his first album barely broke even, his second, The Free Wheelin’ Bob Dylan, saw the young artist get plenty of attention, both as a performer and a songwriter. His songs could have a topical bite, but they also could be wonderfully humorous and artists from all over the world took an interest in his music and his performances. And things would just keep growing from there. By 1965, Dylan was back playing electric rock, although now it was rock that was “realistic, serious and thoughtful.” His four albums from the mid-sixties, Bringing It All Back Home, Highway 61 Revisited, Blonde on Blonde and John Wesley Harding (though the latter was very spare – guitar, bass, drums and pedal steel), would inspire musicians of all genres for the next forty years. After a motorcycle accident in the summer of 1966, Dylan set aside touring for eight years. But he still wrote and recorded at his own home and at “Big Pink,” a house where the Band (who as “The Hawks” had backed up Dylan in some of his early electric sets) worked and lived. Much of the music recorded there was released years later as “The Basement Tapes.” He also still performed, playing at Woody Guthrie’s memorial concert in Carnegie Hall in the winter of 1968 (Guthrie having passed away in October 1967) as well as the Isle of Wight Festival in the summer of 1969. While some fans will claim his music through the sixties as their favorite, others will be just as (if not more) passionate about his work of the 1970’s. Planet Waves, Blood on the TracksÂ¸ Desire and Street Legal, gathered all sorts of reviews, some good and some not so kind. Blood on the Tracks, much like the Kinks’ The Kinks Are the Village Green Preservation Society, has seen much of the critical world change its tune – claiming it as Dylan’s finest work. And though his work through the next decade would also set the critics off to both ends of the spectrum, Dylan would be inducted into the Rock and Roll Hall of Fame in early 1988. He would also co-found the band, the Traveling Wilburys, that same spring. Through the present day, Dylan still writes, records and tours. Some of his latest albums, Time Out of Mind (1997), Love and Theft (2001) and Modern Times (2006) show Dylan still can play in almost any style from rockabilly to lounge song, from blues and back to folk. His 2009 release, Together Through Life, featured guests artists such as Mike Campbell (best known as Tom Petty’s guitarist in the Heartbreakers) and Los Lobos, not to mention quite a few songs cowritten with long time Grateful Dead lyricist Robert Hunter. Bob Dylan’s influence on popular music is incalculable. As a songwriter, he pioneered several different schools of pop songwriting, from confessional singer/songwriter to winding, hallucinatory, stream-of-conscious narratives. As a vocalist, he broke down the notion that a singer must have a conventionally good voice in order to perform, thereby redefining the vocalist’s role in popular music. As a musician, he sparked several genres of pop music, including electrified folk-rock and country-rock. And that just touches on the tip of his achievements. Singers, songwriters, and guitar players of all levels can learn from many of Bob Dylan’s classic songs. A lot of his early material features a simple three chord structure arranged to support a singer with no more backing than an acoustic guitar and harmonica. Guitar Noise has covered several classic Bob Dylan songs in our lessons. Some of you may agree with the “Easy” label, but our arrangement of the Bob Dylan favorite Lay Lady Lay (from the album, “Nashville Skyline”) can be played very easily with the use of a capo, plus a very simple picking pattern. More important, though, is that is can be used as a great lesson to help you get used to switching between open position chords and basic barre chords. With some practice and patience, you should find yourself playing it well in no time. Taking advantage of our MP3 lessons, Tangled Up In Blue is a great song for us to focus on strumming. We take another song from Blood on the Tracks, Simple Twist of Fate to use as a lesson in chord progressions and chord construction in open tuning. We also use this song to practice strumming and work on string muting. We also have a rather faithful arrangement of Buckets Of Rain, the closing song from Bob Dylan’s immortal album, “Blood on the Tracks.” Using open D (or open E) tuning, as well as a steady (and incredibly easy) bass part, it’s easy to make this song sound really good. And, it’s excellent practice both for honing your finger picking technique as well as for developing a good sense of syncopation. If Not For You is a another very easy song. Our simple arrangement of this classic will help you with figuring out the basics of playing slide guitar. In our second lesson Open Tuning, Here There Be Monsters, we learn how to put together a fretboard map and use it to figure out chords in open tuning. Follow along until you reach our arrangement of Shelter From The Storm. Other useful guitar tricks appear in the lesson Connecting The Dots Part 3, which features an example from You Ain’t Going Nowehere. Our beginner’s lesson on basic travis finger picking includes a lesson on playing Blowin’ in the Wind. The Dylan classic Knockin on Heaven’s Door also appears in two other Guitar Noise lessons: Tricks of the Trade and Leading Questions.